I am an Atlanta based photographer specializing in fine art landscape and architectural photography. Additionally, I photograph artwork and festival booths for fellow artists. Examples of each can be found in the three galleries shown on this page. 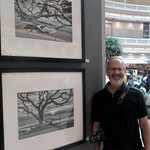 My Fine Art Landscape work can be seen and purchased at the North Park Gallery on Marietta Square in Marietta, GA. I am available for architectural and artwork assignments and my landscape photographs can be purchased as limited edition custom prints (click on the Purchase Prints link below for pricing). To purchase prints, schedule a photo shoot or for further information please contact me at bvangrov@yahoo.com.New images are added often, so please check back periodically to see updated image galleries. I WAS HONORED TO BE FEATURED IN VOYAGEATL MAGAZINE "THOUGHT PROVOKERS" SERIES. YOU CAN READ THE ARTICLE AT: voyageatl.com/interview/check-barry-vangrov-s-artwork. MY PHOTOGRAPH "SUNRISE ON MILL CREEK LAKE" HAS BEEN SELECTED FOR THE PRESTIGIOUS APPALACHIAN MOUNTAIN PHOTOGRAPHY COMPETION EXHIBITION AT THE TURCHIN CENTER FOR VISUAL ARTS IN BOONE, NC. THE SHOW RUNS FROM MARCH 1 TO JUNE 1, 2019. MY PHOTOGRAPH " DRIFTWOOD TREE WITH RISING SUN" WAS SELECTED AS A FINALIST IN NATIONAL WILDLIFE MAGAZINE'S 2017 PHOTO CONTEST OUT OF OVER 25,000 ENTRIES WORLDWIDE. MY WATER ABSTRACT IMAGE "(FALL) REFLECTIONS #5" PRINTED ON DYE-INFUSED ALUMINUM WAS AMONG ONLY 56 WORKS OF ART (OUT OF 1341 WORKS SUBMITTED) PURCHASED BY FULTON COUNTY PUBLIC ARTS TO HANG IN ONE OF THE COUNTY BUILDINGS.